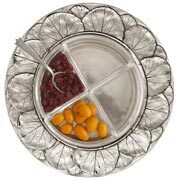 These simple pewter trays, handcrafted by Italian artisans, inlaid with solid or ceramic glass square dishes, are a unique and extremely useful and attractive addition to your kitchen. Hors d'oevre, nibbles, canapes, crudités, call them what you will, but whichever term you choose, all manner of foods look all the more appetising when served within these attractive trays. For those interested in etymology, hors d'oevre simply means 'outside the main work', in other words not the main meal. The word crudités derives from the Latin word crūdus which means "raw", which later became crūditās, meaning "undigested food", which evolved into the French word crudité, meaning "uncooked food". The word canapé originates from the French word for sofa, as the garnish sits on top of the bread, cracker,blini, like a person on a sofa. Whatever your preference for "uncooked food", the crudités tray is ideal for holding olives or sun dried tomatoes, or for dipping sauces for a plethora of cut and sliced raw vegetables, or less healthy dipping crisps and chips, the choice is endless. The crudités tray complements the simpler vanity tray, one of a number within the Umbria range, all of which suit culinary and also vanity uses - looking equally at home in the bathroom or bedroom as well as the kitchen or dining room!